Streaming coloss Spotify announced it closed 2018 with 96m paying subscribers around the world (that's to say up by 25m year-on-year).In Q4 alone, Spotify added 9m subscribers – an average of 3m per month. The firm finished Q3 2018 with 87m paying customers worldwide. The company expects to complete Q1 this year with between 97m and 100m subscribers worldwide. movements in our share price in Q4 had a [positive] sizeable impact on our reported results” but that “the business would have been profitable regardless. 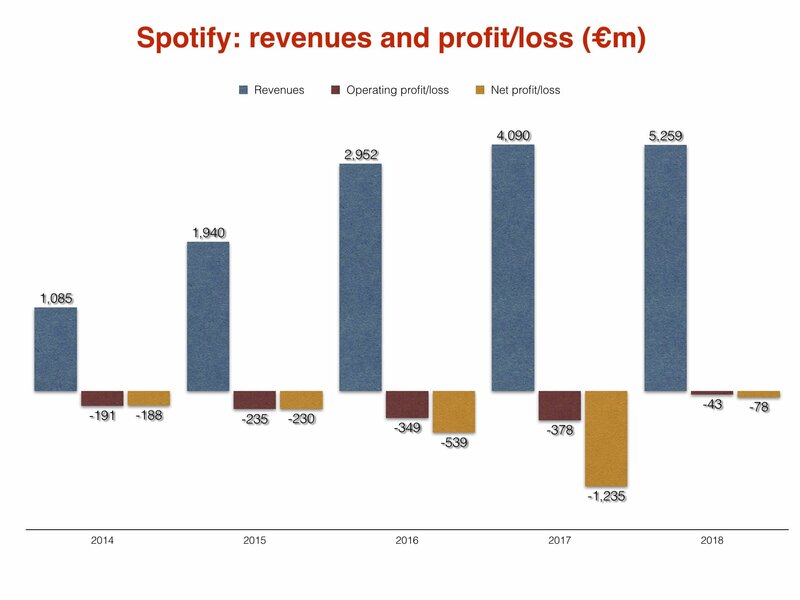 These results mean that, for the full year of 2018, Spotify’s operating losses stood at just €43m, nearly nine times smaller than the €378m operating loss it recorded in the prior year. Its annual net loss in 2018 was €78m. Full-year revenues at Spotify surged in 2018, hitting €5.26bn, up 28.6% on the €4.09bn posted in 2017.